It has been said that, “Genealogy without documentation is just mythology”. That saying can definitely be applied to a number of persistent errors regarding the immediate family of the immigrant ancestor Thomas Barnum (1625-1695). 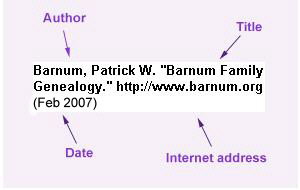 The genealogy of Thomas Barnum has been thoroughly researched over a period of more than three centuries and the persons, dates and places associated with his life are well known and carefully documented. In spite of that, literally dozens of entries in both written and Internet genealogies list unsourced information that conflicts with his known genealogy. For example some call him “Thomas (Earl) Barnum”, suggesting a connection to English minor nobility, and others show him as married to Mary Feaks or Feake. Still others list Phoebe Park as one of his wives. No accurate, verifiable source documentation has been found to support any of those statements. Unfortunately, though, the erroneous data continues to be accepted and cited in family genealogies without adequate research or valid documentation. Research indicates that a part of the difficulty likely arose over 60 years ago with erroneous postings to the Ancestral File of the Church of Jesus Christ of Latter-day Saints (LDS Church). Although that data is accepted without question by many hobbyists and amateur genealogists, an entry in the Ancestral File without supporting sources does not represent valid documentation. The LDS Church itself is careful to state that the information found there is volunteered, not researched or solicited, and has not been verified against any official records. The Church website states: "The information in Ancestral File is a composite of information from many different contributors which may include some discrepancies and duplication. Verify Ancestral File information by comparing it to information from other sources. Be aware that: 1. Some people may have contributed incorrect or incomplete information. 2. More than one person may have contributed information about an individual you are looking for, which may cause some discrepancies and duplication. 3. Errors may have been made when data contributed on paper was typed into the computer." The Church also states that it is the responsibility of those who use the file to verify its accuracy. Even so, the incorrect information is frequently cited without verification, perhaps under the false impression that it represents valid genealogical research. Here is just one example of the reason for careful research and documentation of Ancestral File data. In addition to the unsourced entry for Thomas Barnum and Mary Feake, with a marriage date of about 1684 in Connecticut, a review of the Ancestral File shows marriages for Thomas Barnham and Mary Feake in London about 1586 and three separate marriages for Thomas Barneham and Mary Feake in London with dates of 1577, 1586 and 1595. No sources are given for any of these. However, Thomas Barneham is named in the will of William Feake, dated 7 May 1595, as the husband of his daughter Mary Feake, born about 1565. The will states that Mary Feake married Thomas Barneham, a son of Thomas Barneham and Alice Cressey and that Thomas died (without issue) about 1614. Here, then, is documentary evidence that Mary Feake was not a wife of the immigrant ancestor Thomas Barnum (1625-1695). The correct information about Thomas and his wives, noted below, is supported by references to valid and independently-verifiable sources (14 of them at last count). Thomas Barnum (originally Barnham, sometimes Barnam) was born in 1625 in Hollingbourne, Kent, England; arrived in the British Colonies of North America about 1640; and died 26 December 1695 in Danbury, Fairfield, Connecticut Colony. He married (1st) in 1660 in Norwalk, Fairfield, Connecticut Colony, Hannah [surname unknown], who was the mother of his ten children. Hannah’s surname is sometimes cited as Hurd but no verifiable documentation has been found for that usage. It is believed to have arisen from a confusion with the married name of his second wife and has generally been discounted. Hannah died in 1683 and Thomas married (2nd) about 1688 in the Connecticut Colony, Sarah (Thompson) Hurd, the widow of John Hurd, Sr., of Stratford (d. 1681). All of that information, and much more, is documented elsewhere within this genealogy. ©1998, 2006. The format of this website and all original statements and narrative included on it are copyrighted and all rights are reserved. Factual information may be freely quoted for use in private genealogical research when accompanied by a full source citation, including the date of acquisition. Click here to view the format of a citation for an Internet resource. The publication of large extracts from this site in any form requires prior written consent.